If you didn’t know it already, turkey decoys work. They pull gobblers closer, they lure call-shy birds out into the open, and they take a tom’s attention away from a hunter’s hen yelps. Simply put, they can make the often difficult task of luring a wary gobbler into shotgun range a whole lot easier. Although modern turkey decoys have been around for two decades or more, many hunters are just now realizing how effective these tools can be. They don’t always work, but decoys can give even the most skilled spring gobbler hunter an added edge that might mean the difference between a long, frustrating season and bragging rights back at the office. “I never hunt without at least three decoys, and I’ll even use as many as five or six if I think the hunting will be tough and the gobblers aren’t interested in coming into a pair of hens and a jake. Some guys laugh when I tell them how many decoys I use sometimes, but the results speak for themselves,” says Chuck Tiranno, a turkey hunting guide and member of the Knight & Hale Ultimate Hunting Team. Nothing is ever foolproof, he admits, especially when it comes to spring gobbler hunting, and a decoy won’t take the place of basic woodsmanship, good calling and a little common sense. Tiranno knows that something can–and often does–go wrong in the spring turkey woods. He also knows that decoys don’t always work, even when things go as they are supposed to. In situations where decoys are used in open areas, it’s often best to station them on an edge where vegetation provides a backdrop. It’s a setup that tends to look more realistic. The 54-year-old Shelby, New York, resident was guiding a friend on New York’s opening day under nearly perfect weather conditions. He was using a small flock of decoys, including four hens and two jakes. Here’s a classic example of what not to do. The hunter here would be in the line of fire should someone sneak in from this direction. Also, even though an approaching tom’s attention will be focused on the spread, he gets a good view of the hunter as well. Centralia, Missouri guide and fellow Knight & Hale pro staffer Chris Parrish has been using turkey decoys for about 20 years. He’s used them on hunts for the four major North American subspecies and in 16 different states. During the early days of modern turkey decoys, hunters typically used one replica, a hen, and that was often enough to fool even the wisest old tom. The first decoys were made either from bulky Styrofoam or clunky hard plastic. Both styles were difficult to tote through the woods, noisy to set up and not necessarily the most realistic-looking creatures in the forest. Still, they worked. Decoy manufacturers soon caught up with the rapidly changing world of spring gobbler hunting, and now hunters have a world of choices that simply weren’t available 10 years ago. Lifelike decoys in both hen and gobbler configurations–along with bodies that are collapsible or inflatable and thus easy to carry–give hunters every reason to tote a few of these every time they plunge into the spring woods. And the key is just that: a few decoys, not just one. Expert hunters such as Tiranno and Parrish have had enough experience to know that the best setup is a spread, and both hunters typically use three fakes. With a single hen decoy, Tirrano says, a gobbler that spots it on the way in may hang up and wait for her to come to him. With a spread, though–two hens and a jake, typically–a gobbler can be forced into action. He places his decoys in such a manner that the jake is slightly closer to the shooter than the hens. In many cases, he’ll actually set the young male decoy in the opposite direction of the gobbler he wants to call in. That way, the gobbler will have to walk past the shooter, offering a closer shot. Although hunting accidents are statistically rare, spring gobbler season has the highest incidence of hunters shooting other hunters. Unfortunately, too many hunters fire at the first sight or sound of a turkey–even if it happens to be hen yelps coming from your mouth or hands–or they shoot at the sight of a standing bird. That’s why both Chris Parrish and Chuck Tiranno set up their decoys in what Parrish describes as a defensive layout. He always considers the possibility that another hunter might sneak in to his setup. “I never line up the decoys with my position. I try to guess where another hunter might come from, and I position my decoys so that I won’t be in somebody else’s line of fire if someone should walk up and shoot on sight,” says Parrish. Neither hunter uses decoys on public land or on private property that has high hunting pressure. Parrish also uses a set of three decoys, but early in the season, when the hens haven’t committed to the gobblers, he’ll often stick with a duo of hens. Later in the season, Parrish takes his decoy strategy to the next level, and he’ll even piggy-back a jake on top of a hen to create the appearance of a younger bird breeding a hen. The Carry-Lite decoys he uses allow him to push a single stake through two birds. The pairing, he says, can incite a gobbler into walking straight in without the least amount of hesitation. Most of the time, however, he’ll place a jake right next to a hen with a second hen close by. “It’s really a guessing game. For as long as I’ve been hunting these birds, one thing I’ve learned is that there is no perfect scenario or no ideal way to set the decoys. Really, I think many hunters give turkeys way too much credit, and I tell people to try different things and see what works and what doesn’t,” says Parrish. Both men like to set their decoys in an area where the approaching gobbler can see them–but not in such a wide-open setting that any incoming tom can will have too good a look. “If you stick them out in the middle of an open field, the gobbler can study them as he approaches. If the decoys are motionless, the gobbler might get nervous. I’ve seen that happen on plenty of occasions. Turkeys are always moving. Even if they are standing still, their heads are always moving,” explains Parrish. Instead of placing his decoys in the open, Parrish prefers to set up his fake birds along the edge of the field so they have a background behind them. He might even place one of the hens just inside the woods if the edge of the field isn’t so thick that it would prevent an approaching tom from spotting it. Tiranno likes to place his decoys along old logging roads, field edges and openings within thick woods, and he agrees with Parrish that it’s not a good idea to place the decoys in the middle of a wide-open field. “If that’s your only choice, then try to add some movement. Use a decoy that swings in the breeze or tie a piece of string to it and give it some movement. That’s usually all it takes to put a nervous gobbler’s mind at ease,” says Tiranno. Parrish employs a length of 30-pound clear fishing line and attaches it to one of his decoys. If a gobbler hangs up and refuses to close the distance, Parrish will give the line a few tugs. That’s often enough to convince the tom to take those last few critical steps. Nothing is foolproof when it comes to any kind of hunting, not even a set of turkey decoys combined with the sweetest yelps and clucks you can offer. But since the odds are in the gobbler’s favor, why wouldn’t you carry a few decoys every time you slip through the woods? None of us will ever know how many of the turkeys that showed up at our decoys would have come within 40 yards had we not used decoys at all, but that question doesn’t consume us for very long. We know full well that when we skillfully perform all other functions and deploy decoys as part of an overall plan, we not only boost our chances for success but expand the range of good things that might happen. As I look back over the past half-dozen seasons, I find it hardly coincidental that the use of decoys contributed much to the highlights. On one momentous morning a few seasons back, a partner and I were huddled on the downslope of a west-facing ridge. We’d called to what sounded like a ton of birds roosted in the ravine below us, and for a good half-hour we listened to their loud, purposeful gobbles echo down into the valley. Once the birds pitched down, they went silent and so did we. We had three decoys–two hens and a jake–set up 15 to 20 yards in front of the juniper that concealed us in the middle of a meadow, and here came the birds. At first, they were obscured by ground cover, but we spotted them coming uphill. They were on a path that quartered away from us, but once they reached an opening that afforded a look at our decoys, the entire flock changed course and bore down on us. We’d hoped the decoys might pull a few of the birds off the main body, but in no time we found ourselves seated in the eye of a swarm. Gobblers were lit up, jakes were excited, hens were angry and I whispered “Holy cow!” My partner and I picked out two toms, made good shots on each, then had confused survivors flying up into our faces as we rushed the fallen. More recently, a friend from the East Coast and I spent an opening morning in an enviable situation. We had a gobbler in our decoys, and after we watched him display for about a half-hour, we had to beg the bird to come out of strut and present a shot. We’d set up in thick cover along a creek and faced across a pasture into a tall and steep, oak- and pine-covered ridgeline we’d heard gobbles come off of. It took patience, but eventually, a hen burst from the high ground and gently sailed down into our dekes. She fidgeted for awhile not 20 yards in front of us, and we sensed her growing resentment of present company. She started pecking and grappling two faux hens in a spread that also included a jake and, as we suppressed our laughter, we hoped a gobbler might hear the commotion and choose to get involved. About 20 minutes later, we saw a gobbler emerge onto the multi-hundred-yard path between our meadow and the ridge, and we witnessed his entire approach. The gobbler’s arrival calmed the hen, then the tom went into the strut and stayed there. We watched the tom display for about a half-hour before my partner got the feeling it was time to end the hunt. My partner whistled, but the gobbler stayed inattentive and puffed up. My partner whistled again, and the turkey’s continued unresponsiveness tripped his patience. “Hey, turkey!” he barked at a volume and suddenness that startled even me. The tom snapped to as if doused with Gatorade, and the rest was easy. Such experiences are shared by turkey hunters across the country each spring, and I think I can speak for the vast majority of them when I say that it’s the ability of our decoys to expand the possibility of what might happen that makes us not want to wander out there without them. Veteran turkey hunters recognize that using decoys is part of a process rather than a singular solution. It would be convenient as heck if we could set out a deke at the comfiest location and hang back waiting for action, but effective decoying requires a certain degree of effort and woodsmanship. Specifically, no matter how diligently you choose and lay out your decoys, you can’t fully benefit from them unless you put yourself in the right place and possess some skill in calling. Veteran turkey hunters emphasize that calling and decoying work side by side in their game plans, but by no means do you have to be any kind of master caller to generate the kind of action you’re seeking. Even if you’re minimally secure in your calling ability, you can get by just fine as long as you don’t exceed your limitations. Trust your decoys and concentrate on calling just enough to bring a gobbler within sight of them. If a gobbler appears and you don’t feel you can make the soft, specialized sounds often associated with close-range turkey work, don’t worry about it. Stay silent and let your decoys do the rest of the job for you. 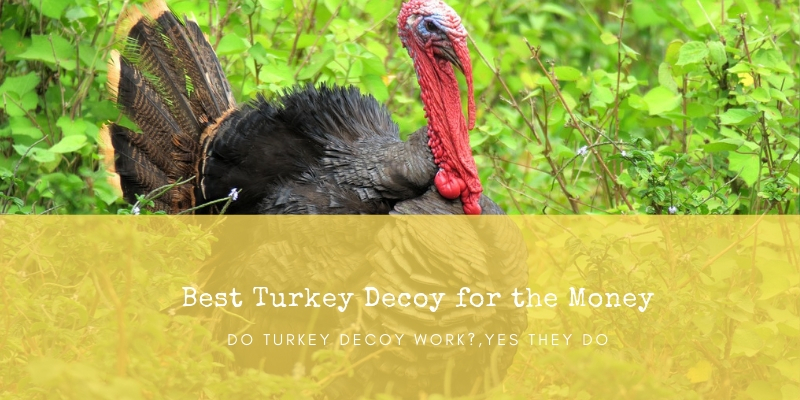 Even callers who can reproduce all the sounds in a turkey’s vocabulary appreciate the fact that using decoys takes some of the pressure of a hunt. The chance to shut up and watch good things happen excites them as much as it does the rest of us, and it’s an opportunity that could never happen too frequently. You want your call to capture a gobbler’s attention or at least peak his curiosity; and, 3) You want to let your decoys close the deal. Laying out your dekes is the simplest step in the entire decoying process, but you still have to put some thought into your choice of decoys and how you set them up. Hens, jakes and mature toms are the decoy types you have to work with, and in choosing your arrangement you’ll be attempting to incite a gobbler through either of two urges that make him vulnerable at this time of year. 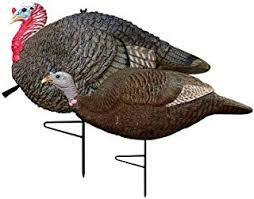 Hen decoys, obviously, target a gobbler’s breeding urge while jakes and mature toms tempt his need to exert dominance. For this reason, a spread that mixes jakes and/or mature toms with hens has a two-pronged effect. Few hunters ever deploy more than three decoys at a time, and a typical three-deke spread consists of two hens and a jake. Early in the season when birds are still in mixed flocks, there might be situations in which it’s advantageous to add more hens or jakes to the spread so that it gives off kind of a “the more the merrier” effect, but it’s often a hindrance if not complete waste of time to set out more decoys than truly needed. With regard to mature tom decoys. . .
Well, they’re kind of the niche members of the lot. When they work, they work very well, but if pressed into a wrong set of circumstances they can do the exact opposite of what you want them to. It’s not uncommon for phony toms to bring real ones charging into a spread, but there’s the risk that the gobbler you’re working might feel inferior to the fake one you’re deploying, and if that happens your real gobbler probably can’t be coaxed into coming in close enough to get his fanny whupped. My friend Brad Harris–a representative of Lohman Game Calls, Feather Flex Decoys, and other brands within the realm of Outland Sports–is infinitely more experienced than I am with decoys. It’s always interesting to hear him recount just how far the practice has evolved over the past decade or so. Inflatable decoys that can be blown up like a balloon aren’t as natural looking as other decoy types, but they’ve proven effective and are the most convenient to use. “I started out using just a hen decoy,” he recalls, “because that was all that was available. We used to have them mounted in fall, then use them in spring. We had great success, but there were times a gobbler would come in to see that hen, then hang up. Depending on what decoy alignment you want to go with, there are a few considerations that should determine what you put where. On occasions when I’ve set up a single hen, I’ve done just fine by putting her within 20 yards of where I’m sitting. When I use a pair of hens, I either set them up at the same distance away from me or stagger them with one five yards closer to me than the other. When I add a jake to comprise a three-decoy spread, I go with the traditional V-pattern that’s so commonly practiced by decoyers everywhere. In any V-pattern that involves the use of a male decoy–whether a jake or mature tom–it’s important that you set it up closest to you in the bend of the alignment. More often than not, an approaching gobbler will walk right past any hens you put out there to take a shot at his rival, and you want to enable him to provide the cleanest, closest shot possible. “I’m pretty sure that 90 to 95 percent of the time a gobbler comes in, he’ll come straight to my jake,” says Harris. “At times, especially while bowhunting, I’ll position the jake so he is facing my position; many times, gobblers will come in and strut around to face the jake and turn his back to me. Another trick Harris borrows from his experience as a bowhunter is to use his decoys as yardage markers. “I like to know how far away from me the decoys are, and use that to adjust my aim when a shot’s there,” he says. From what I’ve seen, it doesn’t take an exact replica to draw the desired response. Nevertheless, in recent years decoy manufacturers have continued a pronounced move toward making their products appear more lifelike. They’ve been using better materials, applying better artwork and sizing the decoys to more closely approximate live birds. Still, I’m as confident in the first set of decoys I ever bought as I am in the most recent, spruced up version I acquired. For the most part, three types of decoys get the most play from turkey hunters today. The collapsible foam or rubber types are the ones that probably come to mind first, but I’ve had a lot of fun with silhouettes and the inflatable types that have emerged during the past few seasons. Foam or rubber collapsible shell-type decoys remain the most popular, and their overall quality has really been enhanced since I started using them. Their inherent advantage is in their textured characteristics, and in recent years advancements applied to their artwork and form has given them a much more detailed, lifelike look. Additionally, more rugged materials used in their construction have increased their durability. In the past couple years, inflatable rubber decoys have appeared on the market, and I had excellent results in using them for the first time last spring. Like collapsible foam or rubber shells, they offer 3D capability but can’t quite measure up in terms of detailed artwork. In actuality, decoys fill a supporting role, since they can work only if you first bring in a gobbler close enough to see your setup. Nevertheless, while inflatable decoys don’t possess the realistic look of other decoy types, I’ve found them to be highly effective on the birds I’ve hunted, and I’ll probably turn to them first this year. They are not only the easiest of all decoys to carry, but they’re the quickest to set up or take down, and such conveniences go a long way whenever you have to be mobile to get your bird. The inflatables I’m using can be rolled up and carried in a cargo pocket, then blown up or deflated in less than 10 seconds. Inflating them to full size is simply a matter of blowing four or five breaths into their stem, then closing the same type of valve that’s used in beach balls. Particularly if you’re the type of hunter who likes to run and gun to hit a number of spots during the course of a day, you might want to use an inflatable on the ground that you hunt. At first, they might look like something you’d play with in a swimming pool, but you’ll come to respect what they can do. If viewed from the right angle, silhouette decoys might be the most natural-looking decoys out there. The set I ordered features photo realism, and I can’t tell you how many times I’ve spotted them out of the corner of my eye and for just a second thought, Turkeys! The challenge in using silhouettes is to make them visible to any gobblers that come take a look. Because the decoys are only about 1/8-inch thick, if they’re not standing broadside when a tom takes a peak, they might not get seen at all. Along with that potential drawback, silhouettes are the least convenient decoys to tote, and as a result I’ve resigned myself to using them only on a fixed location where I know which directions the birds are coming from. Whatever your choice in decoys, there’s no doubt that if you use them smartly and in support of your other skills, they can bump your turkey hunting experiences up to a level you might never have dreamed was achievable. In other words, well-deployed decoys let you see things in the turkey world that you would otherwise be exposed to only by watching the Saturday morning huntin’ shows on cable, and trust me, the events are better seen live. Successful turkey hunting is all about building a gobbler’s confidence and keeping your presence a secret. The advice discussed in this article can help you do that, and if you put it into practice on every hunt, you’ll discover that tricking a gobbler into shotgun range doesn’t always have to be supremely difficult.